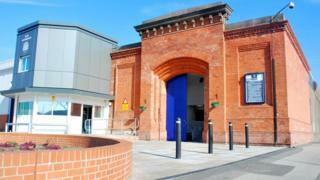 A person has been charged after a jail officer had his throat minimize at HMP Nottingham. Police have been referred to as at about 10:00 BST on Sunday after what union officers referred to as an “unprovoked assault” by a prisoner with a razor blade. The Ministry of Justice mentioned the officer wanted 17 stitches. Michael McKenna, 25, has been charged with grievous bodily hurt with intent, wounding with intent and a racially aggravated public order offence. He’ll seem at Nottingham Magistrates’ Courtroom later. He mentioned the 23-year-old had been a brand new member of employees. HMP Nottingham is a class B male jail which expanded in 2010 to carry 1,060 prisoners. Final 12 months the federal government was ordered to make fast enhancements on the jail after a report warned it was in a “harmful state”. The jail wanted to do “way more” to sort out the issue of medication which was “inextricably linked” to violence, chief inspector of prisons Peter Clarke mentioned in his report.